Most prostate cancers are indolent and will not progress to cause significant disease. Due to the lack of prognostic or predictive biomarkers there is difficulty in deciding whom to treat and how, thus leading to unnecessary morbidity and mortality due to overtreatment and undertreatment of the disease. Prostate cancer growth is dependent upon androgen receptor (AR) activation, which is achieved via phosphorylation. Previous research has shown that phosphorylation of the AR at serine residue 81 (pARS81) and 578 (pARS578) were associated with worse clinical outcome. Protein kinase C (PKC) is one kinase that can mediate AR phosphorylation and Scansite 2.0 predicted PKC as a strong candidate for mediating phosphorylation at Ser-578. This study aimed to establish if AR phosphorylation at Ser-578 by PKC is of prognostic significance. Immunohistochemistry was employed to stain for expression of AR, pARS81, pARS578, PKC and phosphorylated PKC (pPKC) in 90 hormone-naïve prostate cancer specimens. Cytoplasmic and nuclear protein expression were quantified using the weighted histoscore method and analysed with regard to clinico-pathological characteristics and outcome measures: time to biochemical relapse, survival from biochemical relapse and disease-specific survival. Nuclear PKC expression was significantly associated with expression of cytoplasmic pARS578 (c.c. 0.426, p=0.002) and nuclear pARS578 (c.c. 0.469, p=0.001). High cytoplasmic and nuclear pARS578 expression were associated with disease-specific survival (p<0.001 and p=0.036, respectively). High cytoplasmic pARS578 expression was also associated with shorter time to biochemical relapse (p=0.034) and shorter survival from biochemical relapse (p=0.034). High nuclear PKC expression was associated with lower disease-specific survival when combined with high pARS578 in the cytoplasm (p=0.001) and nucleus (p=0.038). High pARS578 expression is associated with shorter time to biochemical relapse, decreased survival from biochemical relapse and decreased disease-specific survival. 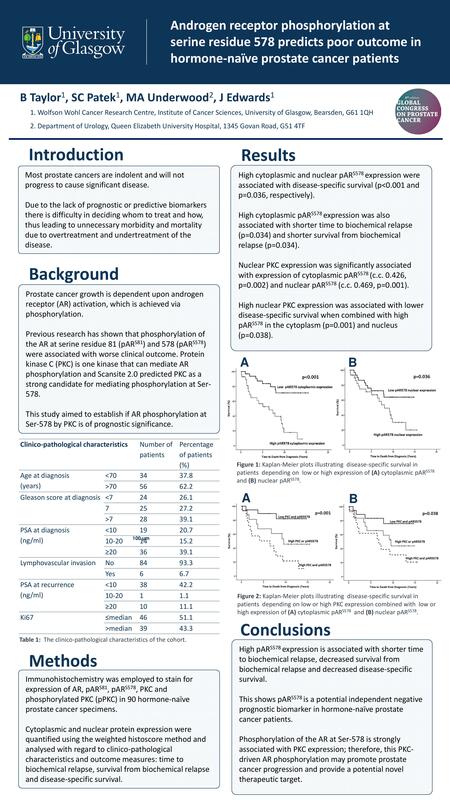 This shows pARS578 is a potential independent negative prognostic biomarker in hormone-naïve prostate cancer patients. Phosphorylation of the AR at Ser-578 is strongly associated with PKC expression; therefore, this PKC-driven AR phosphorylation may promote prostate cancer progression and provide a potential novel therapeutic target.